This Saturday, the biggest fight seen in this generation will finally happen. 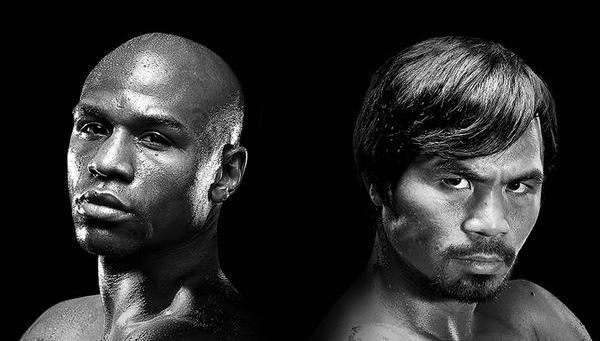 Floyd Mayweather and Manny Pacquiao are undergoing their final preparations before going head-to-head at the MGM Grand in Las Vegas this weekend. The American is undefeated. Mayweather goes in with a perfect 47-fight record, but Pacquiao is pretty sure he will end his career in style in the fight capital. Mayweather enters the ring as the obvious favourite against Pacquiao who has tasted defeat five times in his professional career. It took five years of failed negotiations to get this match to happen. With the fight literally just days away the betting world is getting riled up and ready to make their bets on who will come out the winner. They are set to share a combined $300million from the bout. Mayweather will pocket about $140-$150m and Pacquiao £60m $90m-$100m. That fight should generate so much money mainly because American boxing fans will pay $100 to watch the action live. What’s all the hype about? It’s because Mayweather and Pacquiao are recognised world wide, currently as the two best boxers. And it is once in a blue moon to get two all-time greats fighting in the same weight division at the same time. In the 1980s, whch was probably boxing’s last golden age in the United States, such match-ups happened regularly. Fighters like Sugar Ray Leonard, Thomas Hearns, Roberto Duran and Marvin Hagler were household names and considered heroes. But since then, boxing’s seems to have disappeared from television, and the proliferation of governing bodies and boxing’s politics put the sport in the back of the public’s consciousness. And so a generation grew up without the hoopla and heroics. Boxing has desperately needed two actual superstars to make it the biggest sport in the world once again, and those two fighters can be said to be Mayweather and Pacquiao. Pacquiao, 36, is a six-weight world champion but has been beaten five times in 64 fights since turning pro in 1995. Mayweather, 38, is unbeaten in 47 professional fights stretching back to 1996 and has won world titles in five different weight classes. If you combine their wins, they have victories over many fellow boxing greats, which include Oscar de la Hoya, Marco Antonio Barrera, Erik Morales, Shane Mosley, Juan Manuel Marquez, Miguel Cotto and Britain’s Ricky Hatton. Now that is a list to be reckoned with. What’s at stake? In boxing terms, Mayweather’s WBC and WBA welterweight titles and the WBO title owned by Pacquiao. Also on the line is Mayweather’s unbeaten record. Many are saying that Pacquiao is a dangerous underdog because he doesn’t have as much to lose. Their fight will also go a long way to defining each other’s careers: whoever wins will be able to claim they were the greatest fighter of their era, rightly or wrongly. As for the loser, there will be a lot of soul-searching to do afterwards, but the insane paday should soften the blow. Many are predicting that the fight going the full 12 rounds as both fighters have stamina – and a majority are saying Mayweather will be awarded the decision. That sounds like a boring affair. Mayweather is a defensive boxer and doens’t have an entertaining style that the fans go for. Pacquiao, on the other hand, is an exciting and wild all-action fighter that could be his downfall playing right into Mayweather’s steady hands. If Pacquiao takes an all-out attack stance, then Mayweather will win easily. If Pacquiao is more plotting and cunning, which is probably how he will fight, then things could be more intriguing and an upset could be in the works. If both men show each other too much respect and hold their punches even a little, it could end up being a very boring 12 rounds. Who do we think will win? According to most experts, Mayweather will win. Ricky Hatton, who lost to both men, called Mayweather “a genius” in recent media interviews. Hatton’s fellow Brit fighter, Amir Khan, who wants to fight the winner, also thinks Mayweather will be too clever to beat. However, Pacquiao does have some heavyweight support, with former world champions George Foreman and Mike Tyson both picking him to win it. So it’s really anyone’s fight. We’d like to see an exciting match that could make a lot of bettors a lot of money. Our Pick: Pacquiao in 12, close decision.